Part 6 — How to Update Angular Projects to the latest version. Now that we have an API method to authenticate against our back end, we need a mechanism to store the session data we receive from the API, namely the name and token. Because the data will be unique across our entire application, we’ll store it in a service called SessionService. The --module app.module.ts part tells Angular CLI to automatically register our new service as a provider in AppModule so that we don’t have to register it manually. Registering a service as a provider is needed so that the Angular dependency injector can instantiate it when needed. If you’re not familiar with the Angular dependency injection system, make sure the check out the official documentation. We keep things very simple. We define a property to store the user’s API access token and a property to store the user’s name. We also add a method destroy() to reset all data in case we wish to sign out the current user. Notice how SessionService is not aware of any authentication logic. It’s only responsible for storing session data. We’ll create a separate AuthService to implement the actual authentication logic. Putting the authentication logic in a separate service promotes a nice separation of concern between the authentication process and the storage of session data. This ensures that we don’t have to change the SessionService if the authentication flow changes and allows us to easily mock session data in unit tests. doSignIn(): signs in the user by storing the session data. Again, notice how the authentication logic is defined in AuthService, while SessionService is used to store the actual session data. Now that we have our authentication service in place, let’s create a sign-in page with an authentication form. We define a reactive form as a form group that contains two form controls — one for the username and one for the password. Both controls have a default value of an empty string '', and both controls require a value. If you’re not familiar with reactive forms, make sure to check out the official documentation on the Angular website. First, we check if the form is in a valid state. In the constructor, we configured the username and password form controls with Angular’s built-in Validators.required validator. This marks both controls as required and causes the form to be in an invalid state as soon as one of the form controls has an empty value. If the form is in an invalid state, we enable showInputErrors and return without calling the API. If the form is in a valid state (both username and password have a value), we set isBusy to true and call the the signIn() method of our ApiService. We’ll use the isBusy variable to disable the sign-in button in the view while the API call is being made. If the API call succeeds, we call the doSignIn() method of the AuthService with the token and name from the API’s response and navigate the user to the todos route. If the API call fails, we mark isBusy as false and hasFailed as true so we can re-enable the sign-in button and show an error message in the view. *ngIf="(frm.get('username').invalid && frm.get('username').touched) || showInputErrors"
*ngIf="(frm.get('password').invalid && frm.get('password').touched) || showInputErrors"
First of all, we define a form element and bind it to our reactive form in the controller using [formGroup]="frm". Inside the form, we add an input element for the username and we bind it to its corresponding form control using formControlName="username". Next, we add a validation error to display if the username is invalid. Notice how we can use convenient properties (provided by Angular) such as valid, invalid, pristine, dirty, untouched and touched to narrow down the conditions in which we want to show the validation message. Here, we want to display the validation error when the username is invalid and the user touched the input. In addition, we also want to display the validation error when the user clicks the “Sign in” button and the input has no value. We repeat the same pattern for the password input and add a general error message to display in case the username and password are not valid credentials. When the user clicks the button and an API call is made, we disable the button using [disabled]="isBusy" and change its text so that the user has a visual indication that the sign-in process is busy. so that the user is automatically redirected to the sign-in page when loading our application. created a SignInComponent to sign in users. 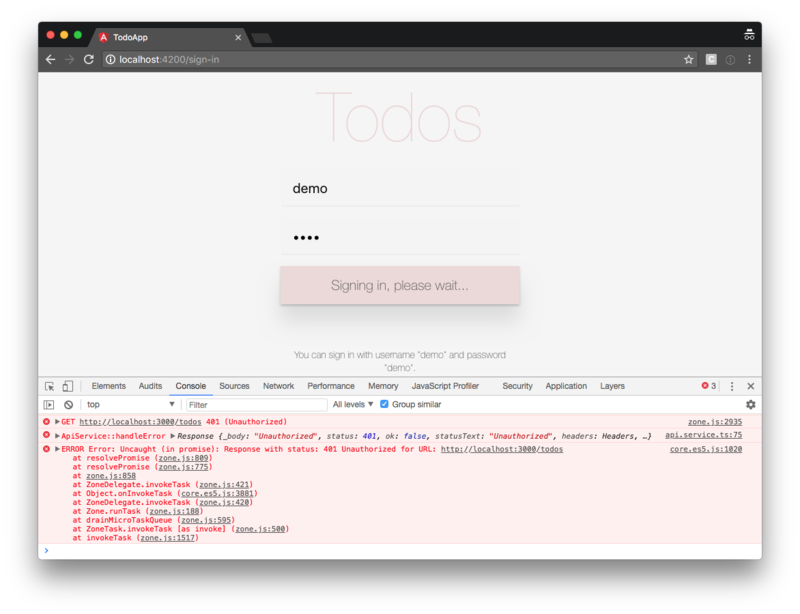 In addition, Angular still allows us to navigate our browser directly to http://localhost:4200/todos, even if we’re not signed in. send the user’s token with API requests that require authentication. Let’s start by securing our application’s private area. In part 4, we already learned how to use Angular Router to resolve data. In this section, we explore route guards, a feature by Angular Router that allows us to control route navigation. In essence, a route guard is a function that returns either true to indicate that routing is permitted or false to indicate that routing is not permitted. A guard can also return a Promise or an Observable that evaluates to a truthy or falsy value. In that case, the router will wait until the Promise or Observable completes. CanDeactivate: determines whether a route can be deactivated. In our application, we wish to make sure the user is signed in when they navigate to the todos route. Therefore, a CanActivate guard is a good fit. Because our guard is a CanActivate guard, it needs to implement the CanActivate interface, provided by @angular/router. The canActivate() method receives the activated route snapshot and the router state snapshot as arguments, in case we need them to make a smart decision whether or not we wish to permit navigation. In our example, the logic is very simple. 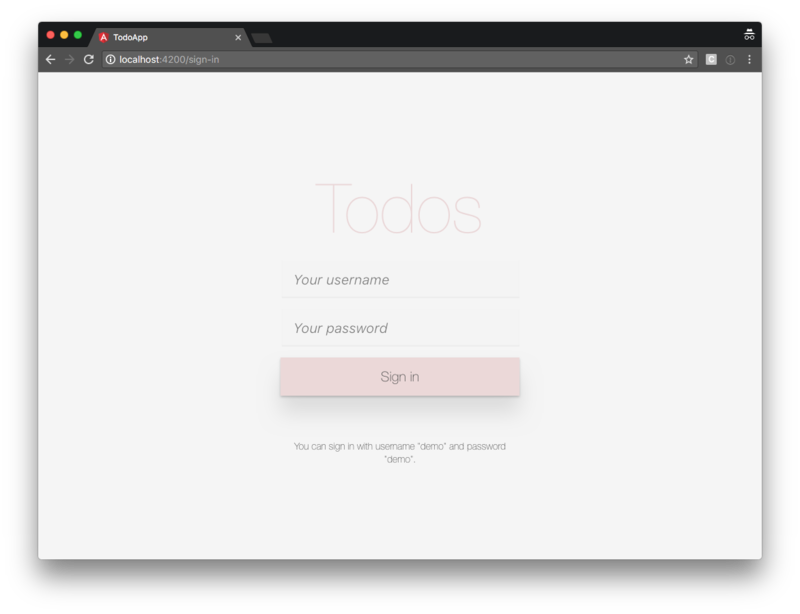 If the user isn’t signed in, we instruct Angular router to navigate the user to the sign-in page and stop further navigation. In contrast, if the user is signed in, we return true allowing the user to navigate to the requested route. Now that we created the route guard, we must tell Angular router to actually use it. The canActivate property accepts an array of CanActivate guards so you can easily register multiple guards if your application requires it. With our route guard in place, our application now redirects the user to the sign-in page when they aren’t signed in and try to navigate directly to the todos route. In contrast, when the user is signed in, navigation to the todos route is permitted. So far, our signed-in user can access the todos route, but the API still refuses to return any todo data because we aren’t sending the user’s token to the API. We instantiate the request options using our convenience helper and pass the options as the second argument in our http call. Always make sure you only send the token to your trusted API. Don’t just blindly send the token with every outgoing HTTP request. For example: if your application communicates with a third-party API and you accidentally send your user’s token to that third-party API, the third party can use the token to sign in to query your API on behalf of your user. So be very careful and only send the token to trusted parties and only with the requests that require it. To learn more about the security aspects of token-based authentication, make sure to check out Philippe De Ryck’s talk on Cookies versus tokens: a paradoxial choice. If you navigate your browser to http://localhost:4200, you should now be able to sign in with username demo and password demo. For the sake of completeness, let’s also add a sign-out button under our list of todos. First, we import the AuthService and Router. Next, we define a doSignOut() method that signs out the user and navigates the user back to the sign-in page. Clicking the sign-out button triggers the doSignOut() method in the component controller, sending you back to the sign-in page. Also, if you sign out and you try to navigate your browser directly to http://localhost:4200/todos, the route guard detects that you are not signed in and sends you to the sign-in page. We covered a lot in this Angular series, so let’s recap what we’ve learned. deploy our application to GitHub pages. a TodoListFooterComponent to show how many todos are left. create an ApiMockService to avoid real HTTP calls when running unit tests. how to use a resolver to let Angular router resolve data. Feel free to let us know in the comments below if you were able to make it work or if you have any questions. All code from this article is available at https://github.com/sitepoint-editors/angular-todo-app/tree/part-5. In its current state, the session data is lost when the browser refreshes the page. Can you figure out what’s needed to persist the session data in the browser’s sessionStorage or localStorage? Let us know what you come up with in the comments below.